Nick Croce, Jr. with two of his favorite pals, Gumby and Pokey. How much fun is it to live in Nick Croce’s world — surrounded each day by Gumby, Pokey, Betty Boop, the Simpsons and a stable of other cartoonish characters whose images he owns licenses to and sells around the world! 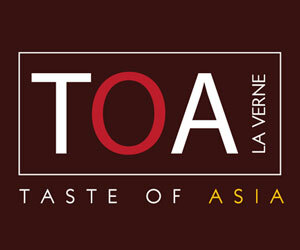 Plus, pity the man’s nine-and-a half-minute commute from his La Verne home to his La Verne warehouse on Arrow Hwy. In appearance, Croce, who grew up in Glendora, sounds and looks like the Phil Dunphy character in the ABC comedy series, ‘Modern Family.” Long ago, Croce, now 50, made a life decision that has served him and his family well. “I decided to ‘make stuff that people don’t need’ for the rest of my life,” he says, breaking into laughter as an employee steps into his office frantically searching for a customer’s contact information. 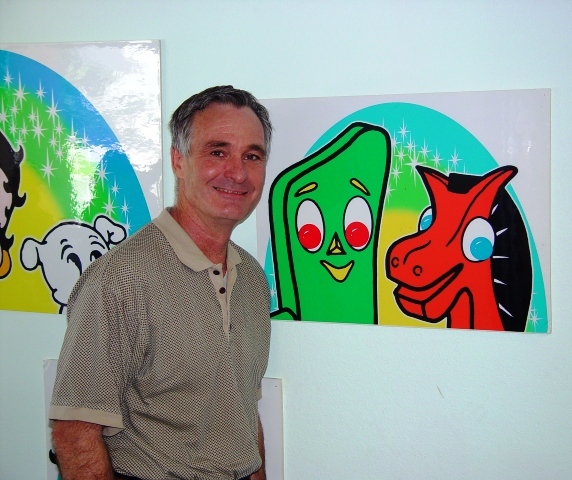 As for Croce’s menagerie of money-makers, Gumby, who first debuted in 1956 as the brainchild of Art Clokey who passed away on Jan. 8, 2010, is his No. 1 top-selling bendable. 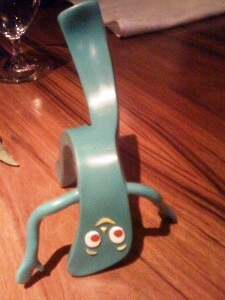 Gumby is adorable and loveable enough, but as a bendable he’s irresistible. Then Croce lets us in on a little secret about our flexible friend. Gumby, who comes in two sizes, 6-inches and 3-inches, is made in a factory in China out of poly vinyl chloride (PVC) and wire (as are Pokey, Prickle, Minga and Goo). While Gumby is lead- (technically few things are completely lead-free, not even human beings) and pthalate-free, the green gingerbread man is not indestructible. Like Gumby, Croce doesn’t have a cross word to say. He is kind to everyone, even attempting to discourage and dispel the myth that Chinese factories are somehow sinister smokestacks of grinding cruelty and child labor abuses. Croce started in the family business in 1981 when he was 22. He and his father, who was changing careers at a time when Nick’s mom was battling cancer, started out importing and selling European brassware. Then in 1983, Nick Sr. signed a deal on the hood of Gumby creator Art Clokey’s 1965 Valiant to license the clay-like Gumby and put his likeness on mugs, steins, tote bags and other “stuff that people don’t need,” but still absolutely have to have. Nick Jr. thought his father had gone off the deep end, but Gumby, now a classic, has endured and been rediscovered by new generations. Perhaps, Nick just wasn’t old enough to understand what he knows now. Then Nick quickly and painfully notes that not everything “nostalgic” sells. He licensed a non-Disney version of Snow White that was tied to a nationwide theatrical release, whose funding fell through at the 11th hour, leaving Croce with loads of gorgeous tee shirts he couldn’t sell. That lesson has kept him from trying to capitalize on other licensing ventures linked to movie releases. “It’s the best way I know to become poor,” Croce says, smiling. “Anytime you get into a theatrical release, it’s very risky. It either hits or it doesn’t hit, and either way you get hurt. Then there are the licensed mega-hit figures that got away. “Somebody once showed me a property about 15 or 20 years ago that to me looked really stupid,” he says, crinkling his nose. “It was an Asian property that had people in tights wearing motorcycle helmets fighting off giant stuffed toys to cheesy music on top of buildings in Hong Kong. I thought it looked so stupid. I turned it down. But don’t shed a tear for Nick. He’s lucked into a few whoppers. He was the 15th licensee for “The Simpsons,” inking the deal before the show even aired on Fox, the result of some good inside information from a colleague who knew the show’s lead animator. He sold 2 million bumper stickers alone. Croce likes to dream like most everybody else. At the top of his wish list, he’d like to add Sponge Bob Square Pants and characters from Dr. Seuss. Licenses can range in cost from free to millions of dollars. “You can’t conquer the world in a day,” says Croce, who built and owns a fully furnished condo-sized tree house in the Trinity Alps of Northern California, just one of his many hobbies. Of course, Croce’s life isn’t all fun and games. He has a business to run, and during the Great Recession, he’s had to cut back staff. As a result, remaining employees have had to become as flexible as Gumby, perhaps working on the computer one moment and filling orders the next. Between them, they can cobble together good conversations in English, Spanish, Cantonese and German, all of which come in handy when reaching out to a worldwide base of customers. Croce obsesses about everything from making payroll to making sure his beloved characters meet and exceed the industry’s standards and testing, not always a slam dunk. No one seems to be complaining about their jobs, however. Working in such a creative shop is what seems to pull everybody through. There is always a sense of humor hanging over the place. Even the company’s new catalog is in on the jokes. Betty Boop actually outsells all-things Gumby, but Croce thinks that Gumby has legs just like Betty. “Gumby has huge potential,” Croce says. “He just has to get in the public eye. Croce is ever hopeful. Different plans are afoot to make Gumby the spokesperson and leader for everything from the health movement to the “Green” movement. “He is green, he is friendly, and he is a decent loving character who always wishes to do good,” Nick says. Another thing it has going — Gumby calls La Verne home! 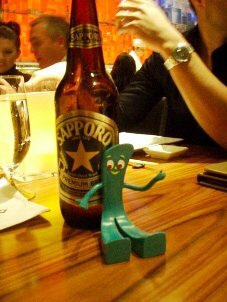 To follow more adventures of Gumby, log on to, www.followgumby.com. To learn more about the unique merchandise offered by the NJCroce company, visit www.njcroce.com.